Goodison Park is the world's first purpose built football stadium and has recorded several firsts in stadium development in England. As well as hosting Everton games the stadium has been the venue for an FA Cup Final and numerous international fixtures, including several in the 1966 FIFA World Cup. Although re-development has taken place, the stadium is very old and as such comes complete with pillars that can and will block your view if in the wrong section. Visiting supporters are seated in the Bullens Road Stand, at the end closest to Stanley Park. 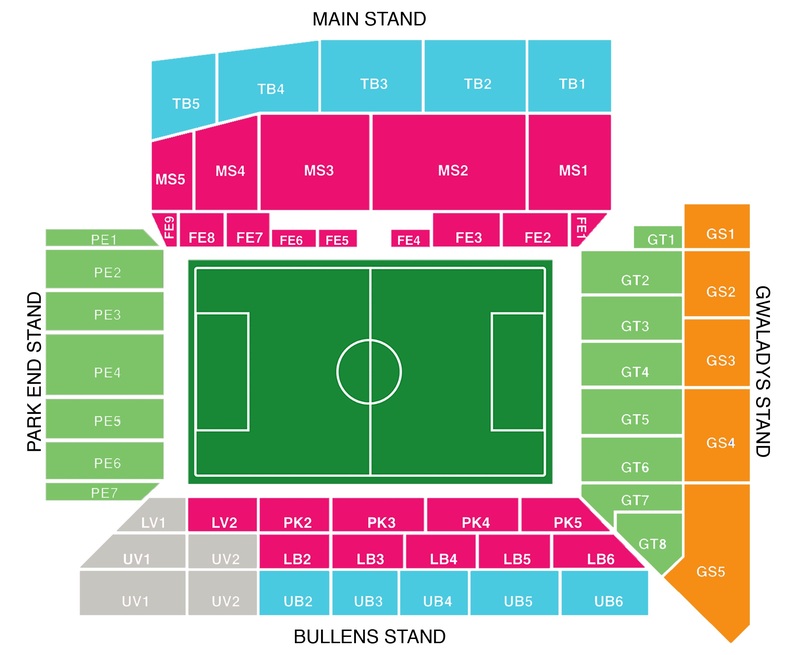 Generally the section of the Upper and Lower Tiers reserved for away fans will seat 3,000 although for games when the away allocation is increased to 10% of the total capacity, the section extends down towards the half way line. Both tiers are close to the Park End stand so you can expect a decent bit of banter with the home supporters. The quality of the seating, leg room and views of the game from the Bullens Road stand is unfortunately not the best. The Lower Tier has a low ceiling, especially in the back rows, which makes it very dark and claustrophobic and you should be prepared to stand up at frequent intervals as well as having to contend with supporting pillars blocking your view. The closest pub to the ground is the Winslow opposite the Main Stand which gets uncomfortably busy in the run up to kick off. It is very popular with Everton supporters and it has a good atmosphere, especially after Everton win! Further up Goodison Road, is The Spellow pub which is ok for a beer. Within a couple of minutes walk from the ground there are at least twelve pubs which are all really friendly and generally welcome home and away supporters. Up by the ground there's no shortage of places to eat and drink. County Road has plenty of places to grab a bite to eat including Sayers, Subway, KFC, McDonalds and numerous chip shops and cafés. Street parking is available, if you're willing to arrive a couple of hours before kick off, in the walton village area. Alternatively, you can pay and display in Stanley park at a cost of £8 or for approximately £3 you're able to stop in the Walton Sports Centre which is just off the A580. If you're coming into Liverpool by train, you will arrive at Liverpool Lime Street, the city's main railway station, which is just over two and a half miles from the stadium. The city is fairly well served by rail from most British cities but for timetables and journey times, click here. The nearest / closest train station to Everton's Goodison Park Stadium is Kirkdale, approximately 1 mile or 10 minutes on foot from the ground. You have the choice of either following the crowds up to the ground or striding ahead and taking the lead, in which case, here's some directions that might help. On leaving the station, turn right and cross over the railway bridge, walking up Westminster Road. Take the third road on your left, (Goodall Street) until it becomes Harlech Street, and you reach the main (A59) County Road which has plenty of pubs and places to eat. Depending upon which of the residential roads opposite you take, the ground is on your right when you reach Goodison Road. Travel: We drove up to Liverpool and arrived around half 2, for a half 5 kick off, and decided to park at the Tesco Metro Liverpool Walton for £5 for match day parking, it was safe and secure which gave you a parking permit. We chose to park here as all the residential streets are all permit parking only between August and May. Refreshments: We went to a chip shop in the high street and for us Southerners it was very cheap, £1.20 for a tray of chips and 70P for a sausage... not bad. Afterwards we walked up through Stanley Park and went to have a look at Anfield, as you approach it Anfield looks massive and the new main stand you could see from very far away. Impressions: Goodison Park is one of these classic grounds which oozes character every step you take around it. From being in the middle of all residential streets you come out and see it shining in all it's glory, the atmosphere around the ground made me reminisce about the times of old when young kids were playing football all in the streets and the roads were all crowded with people coming to watch their favourite team. Absolutely fantastic and the atmosphere is always electric by the away Chelsea fans. Facilities: The concourse is very small and narrow but one where you can create great pre match atmosphere, the toilets are old and rusty and their is a betting counter at the far side of the concourse. The counter for drinks and food seemed very small and the queue was busy long before half time, I did not dare to venture into the unknown as it was too busy for one to handle. We had our seats in the Paddock section of the Bullens, apparently these are the best seats, followed then by the upper Bullens and then Lower Bullens, according to some Everton fans I was talking too avoid the Lower at all costs! Exit: Exiting the stadium was quite easy, we had lost 2-0 and had the sour 250 mile journey back home one we was not looking forward to, we got in the car at the Tesco's and their was around 4 cars in front of us and then clear streets all the way back to the M6. Enjoy: I very much enjoyed my day on my first trip to Goodison. I would recommend a trip to Goodison to anyone who loves the old Stadia such as Selhurst Park, Upton Park, Fratton Park etc. Come to think of it they're all parks. I feel a move to a new identikit out of town stadium will soon happen for Everton but I hope not. Travel: I've been driving to Goodison every other week for 11 years now, and having now been to plenty of other grounds, it can't really be beaten for parking. (Well… maybe matched by Anfield of course!) Stanley Park car park is pricey and takes an eternity to get out of but is always available. For the last few seasons, I've parked at North Liverpool Academy, just around the corner from Stanley Park on Utting Avenue, but the school has now closed. Have parked at the bottom of Cherry Lane in the past, so that is likely to be my new regular parking spot (though it will be odd not walking down Priory Road past the away coaches any more) but it is nearer Goodison than Utting Avenue and just as quick getting away. There is also a fair bit of free parking on Cherry Lane (though check the signs, as it is mixed in with residents parking) if you get there early enough. Refreshments: Another habit I've had to change lately! Got chips and gravy from the Dug Out on Goodison Road every week for years, but it shut down a while ago. Worked my way up the other Goodison Road chippies at each game to find a new favourite, and I've found it at last! Chips and curry, or chips and gravy from the Goodison Supper Bar across the street from the church you will not be disappointed! The Dug Out has now reopened, but sadly the Goodison Supper Bar stole me away during it's brief hiatus! As a result of such fine offerings outside the ground, I haven't ate inside the ground for a couple of seasons.. As for pubs, despite the closure of the Blue House a few years ago, you will still struggle not to get a drink outside Goodison. The Spellow and the Winslow are just outside the ground and always fine for away fans, or you have the choice of literally hundreds on County Road five minutes away the Royal Oak is the only one away fans are advised to stay away from, but even then, there are never problems there unless it's a rival. Impressions: No point in sugar coating it for away fans …the Bullens Road is not the most pleasant away experience you'll ever have! I have my season ticket in the same stand, and as much as I love the place, I can recognise how bad it can be! .. If you're going for tickets, get the upper if you can, then the Paddock. Avoid the lower at all costs! It's where I sit, but then it's cheaper by far than the others, as well as the fact I have my own seat so I know what obstructions to expect. The view really is a lottery as far as the pillars go. The upper has pillars as well, but not as many and the view is excellent. Ditto the Paddock, it's obviously unobstructed being at the front, but of course can be a bit low and get you wet! .. I've sat all over the ground, the Family Enclosure and Top Balcony being the only areas I've never sat. I've even sat in the Press Box once on placement! The pillars are simply a fact of life all over the ground, except the Park End. But it's strange, the Park End is my least favourite place to sit. Despite the fact the views are totally unobstructed, they try to cram in as many seats as possible so as a result, it's very cramped and uncomfortable. I'll stick to my nice wide and warm wooden seats in LB4 thanks! Atmosphere: I've seen Goodison at it's best and it's worst. At our best, it is easily one of the most aggressively supportive grounds in the country. That's what I've always loved so much about the atmosphere when Goodison is rocking. A great Goodison atmosphere isn't about singing a variety of jolly songs about how great we are, it's about raw hostile aggression, scaring the crap out of the opposition, but inspiring to our own players. Millwall and Birmingham are the only other two grounds, possibly Sheffield United too, which have a similar kind of atmosphere. Man United at home in 2005 and the second leg against Fiorentina in 2008 are far and away two of the greatest atmospheres I've ever been involved in, (the FA Cup games at Wembley sneaking in there somewhere too) and I am yet to hear a home crowd that has come close to matching any of those two.. On the other hand though, the fact that it's our aggression that makes us, that can often make for a terrible atmosphere against lesser opposition. A large majority of our fans can be overly demanding to the point of perfection, that one misplaced pass can shatter the confidence of anyone but the strongest players. As such, we also love a scapegoat, which frustrates the hell out of me. Currently it's Hibbert and Billy competing for the slot of favourite scapegoat, while it has seen the likes of Beattie and Kilbane doomed to fail from the start in the past.. Goodison is one of very few grounds I've seen against so much opposition, I know before the game even starts sometimes what kind of atmosphere we're going to have. For those normal games, if there's anything that lifts the crowd it's a shocking ref. The 1-0 win over Blackburn in 2006 being one of the best atmospheres in recent years, and it all stemmed from a terrible ref and perceived injustice.. Oh, and the other thing that gets Goodison going? A tackle…I’ve never known any set of fans that can get so up for a game just as a result of a good hard tackle. Neville on Ronaldo, David Unsworth putting Steve Finnan into the Paddock one year with a crack that could be heard all over the ground, Kilbane on Ronaldo in the opening second of that win over United in 2005…love a good early tackle. Anything Else: No matter how many hundreds of times I go to Goodison, I still have that little second of breathlessness the first time I go up the steps to the seats and see the pitch for the first time that day. And no matter how many times I hear that opening drumbeat of Z-Cars, my heart just absolutely swells with pride. Enjoy: You're never going to get a completely impartial view of Goodison from me to be honest! I know and love it's flaws, but recognise it can be a less than anticipated trip for away fans. For anyone who grew up with grounds like Goodison, it's still one of very few of the real old school left in the top flight these days. Would hate to see it go. 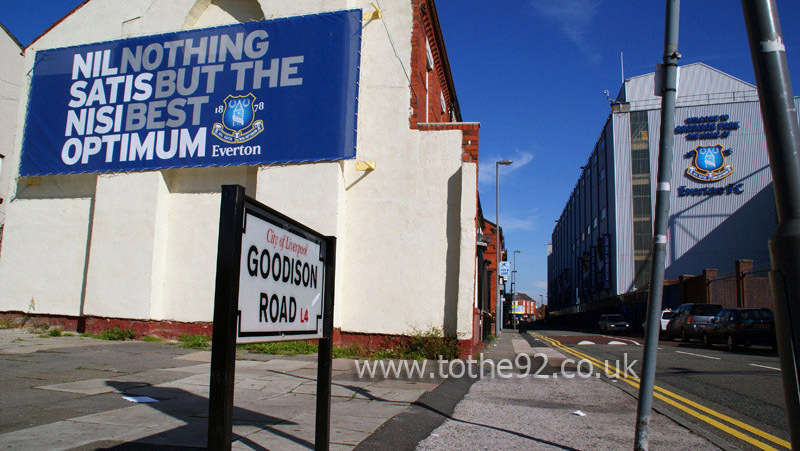 Have you been to see a game at Everton's Goodison Park? To tell us about your experiences and to feature on the site, simply complete the fans review form below!